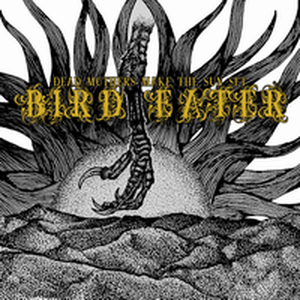 Bird Eater - Dead Mothers Make The Sun Set, 13,60 fr. Dead Mothers Make the Sun Set is just as crushing and dismal as expected. The 11-track offering starts off with some western twang in the guitar-steered Head Smashed in Buffalo Jump before You Don't Belong Here kicks things up with a barrage of riffs, fierce drum blasts and tortured vocals. The cacophonous fusion of death metal with doom elements and country influences forms Bird Eater's Utah-themed sound of despondent metallic noise. While the album features a number of vicious, stampeding tracks, such as The Birds Will Take Your Eyes First, Leather Worker and Judgement, the heavy mayhem of rhythms and volatile growls are juxtaposed with simpler, slow-paced instrumentals Cihuateteo and Gather, which contain gorgeous melodies as desolate as Utah's deserts. Although Dead Mothers Make the Sun Set isn't an easy album to get your hands on ? it's currently only available on vinyl and a digital release is expected at a later date ? it's well worth seeking out.